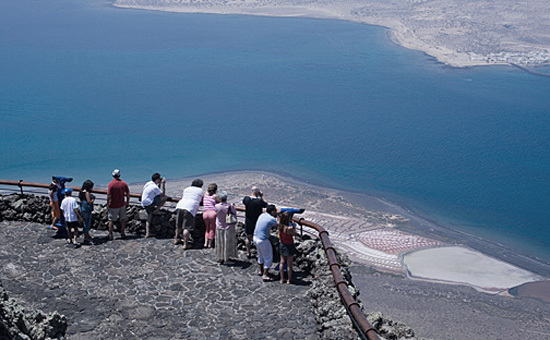 El Mirador del Río is located on top of Risco de Famara, at 475 meters, in the north of the island. 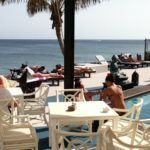 From there you can see one of the most spectacular views of Lanzarote. 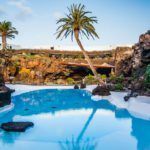 This is one of the most representative architectural creations of Cesar Manrique, where the artist combine artistic and architectural details, in order to achieve an enthusiastic project of integrating art and nature. It is located between two geological features of particular importance: on one hand, the impressive Risco de Famara and, in the other, El Volcán de la Corona, which extend into the arms of the large semicircular plaza that leads to the building. El Risco de Famara is a large cliff that develops longitudinally along 22 kilometers from Punta Fariones, the far north of the island until the Morro del West, near Teguise. Throughout his terrain point is reached higher elevations of the island, the Rocks of Chache, of 671 meters. 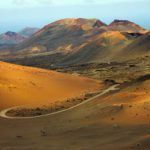 The route runs almost vertical Risco parallel to the coast of La Graciosa, which is separated by a narrow strip of sea, called The River. Of great environmental interest, the Risco de Famara, La Graciosa and the islands next to it, including the seabed, forming a unit declared Chinijo Archipelago Nature Park. 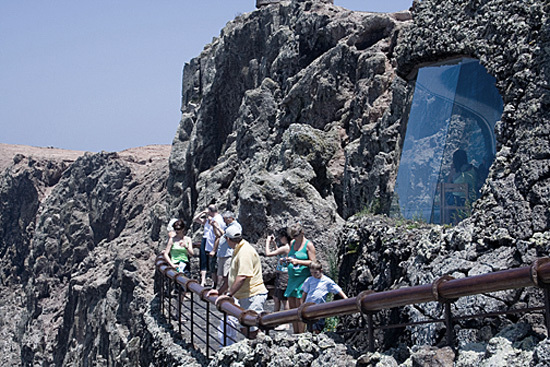 There is a project, before the Mirador del Rio, the architect Fernando Higueras devoted personal friend of Cesar Manrique. This project, chimerical, had the suggestive name of Ciudad de las Gaviotas. 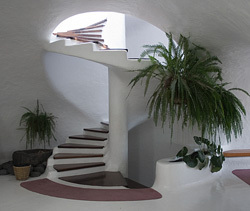 The interior is accessed through a winding corridor in which are located some niches decorated with traditional ceramics made by the craftsman Lanzarote Juan Brito. After crossing this suggestive entry we find two large vaulted spaces, which are placed two large windows of glass-the eyes of the Mirador, which explicitly consider the extraordinary view from a privileged position. In this space we find two original monumental sculptures made with iron rods and plates. These sculptures, suspended from the ceiling and flood the vaulted space screening function as sound reverberation of sound avoided. Located on the outside, highlights a figurative sculpture of wrought iron. Represents a fish and a bird. It is a metaphor of two elements of nature that have strong presence in this landscape: water and air. The two windows slightly concave horizontally and vertically oblique, increase the overview effect, allowing at the same time that the site is flooded with light and communicating the inner and outer space, favoring nature. 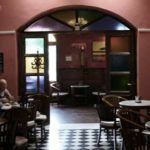 On the first floor we find a souvenir shop, a stay undoubtedly original. In this space where we locate a small unit is a small window shaped oculus from where we can see in the background, the Corona Volcano. Continuing the stairs provides access to the roof terraces through a skylight that is at the top of the building. From the vaulted main hall, described above, we also have access to a balcony that is inserted into the abyss. Note the perimeter railing made of iron and wood that gives this facade the appearance of the bow of a ship. Symbolically, the island would become a sailing ship, heading north on the Atlantic. On clear days and clear, we can contemplate the splendid view of Chinijo Archipelago. 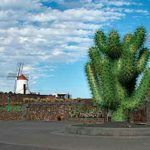 Be seen in the first place the island of La Graciosa, Montaña Clara are behind and Roque del Oeste and in the background, Alegranza and Roque del Este. 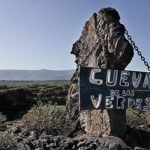 From the viewpoint shows the base of the cliff of Famara and reddish color highlighting, the oldest salt mines of the island, the Salinas River. The technical realization of the work was carried out by the architect and artist Eduardo Cáceres Jesús Soto. The works were completed in 1973, inaugurated the building. The implementation of the building was a display of technical planning, since, with the few available means, had to proceed with the excavation of the ground and, subsequently, make the building and covered with volcanic rock. Environmental and landscape features of the site as well as the particular use to address this experimental work, both in the functional aspects such as aesthetic and constructive solutions. Recommended visiting hours: Especially during high season in summer the afternoon from 15.00 on is the best time to visit.